Here is the whole bouquet of roses that I gave my mom for mother's day. Can you tell she loves white? Her whole living room is white. White furniture, white walls. It's a great room for taking pictures. I’m sorry that Matthew was sick – I hope he gets better soon! Your mom’s roses are beautiful. I love white rooms! I have a book from “Victoria” magazine on decorating all in white, and would love to do it one day, but I don’t think it works well for a colder climate like Chicago. I guess I’ll just have to move to Florida! 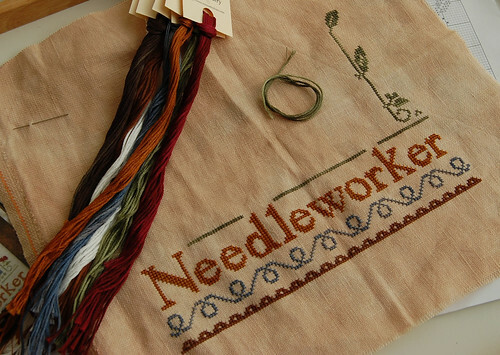 I have “Home of a Needleworker, Too” ready to get started – I’m just waiting on the Crescent Colours to arrive. Your Home of a Needleworker (Too!) looks fantastic! And those descriptions for the new LHN designs sound fantastic! Home of a Needleworker looks great! I can't wait to see the new releases from LHN either. I am a big fan. Lovely pictures, as always, Nicole. Hope Matthew is feeling better~~throwing up has got to be the worst! Nice start on Home of the Needleworker. 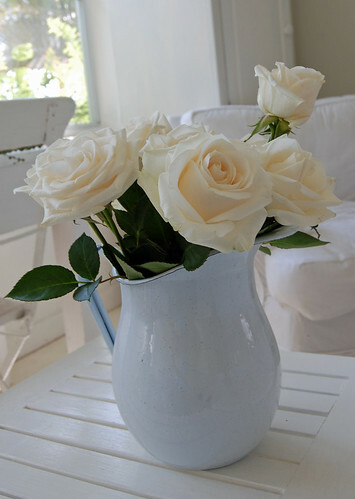 Such beautiful roses - all my walls and paintwork in my house are white - not so the furniture - maybe I should get the paintbrush out - I love white! That photo of your mother's roses could be found in a magazine Nicole! It's beautiful. LHN's new Little Women threadpacks will be a must have. They've got June's release called Quilting on their site. Sorry to hear Matthew's fallen ill again. Hope he picks up soon.